Delaware. The second smallest state within the US, just above Rhode Island. It is, however, the oldest state in the Union, being the first to ratify the new US constitution after the Revolutionary War, thus earning it the moniker of "First State." This does afford the state a prime position in major US events, such as Presidential inaugurations! The territory that was to become Delaware was first claimed by the English, in 1597, but it was the Dutch in the very early 1600's who first settled in the area, swiftly followed by the Swedish. However, the Dutch swiftly took control of the Swedish colonies, only to be forcibly removed themselves by the English in the 1660's! Initially the counties that will go on to be Delaware where placed under the control of James the Duke of York's New York colony. However, William Penn who controlled Pennsylvania wanted access for his lands to the sea, and ended up being awarded the three southern counties on the western bank of the Delaware. 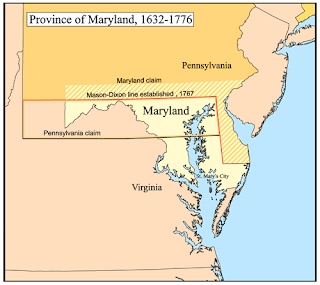 Penn also inherited various competing border disputes between the southern counties, and Baltimore. This was only finally sorted until the drawing up of the Mason-Dixon line in 1763. 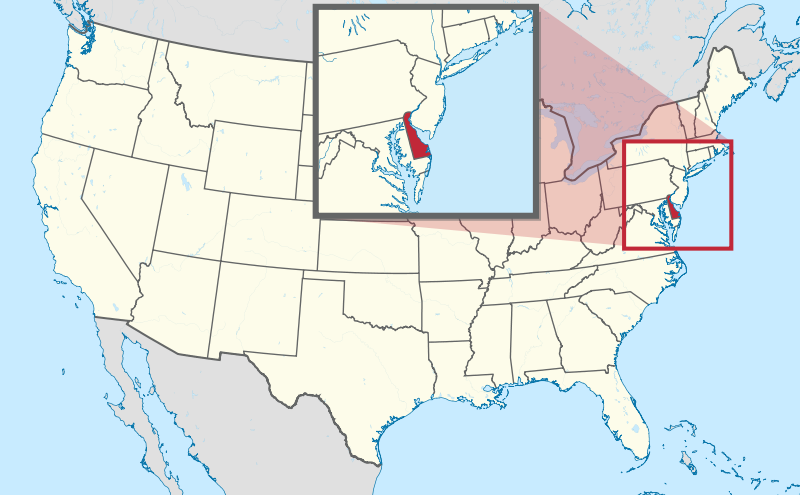 This line would form parts of the border between the current states of Delaware, Maryland, West Virginia, and Pennsylvania. 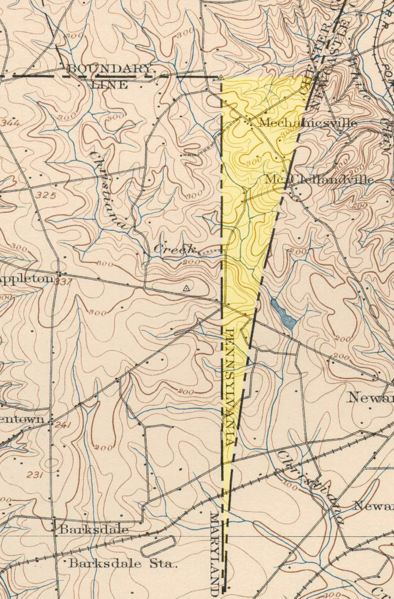 A slight problem with this line was where it met the "12 mile circle" which was drawn round the city of New Castle, which was initially drawn up when the city of New Castle was kept out of Pennsylvania. However, when Penn pressed his case for access to the sea, he ended up with New Castle, and its 12 mile circle. 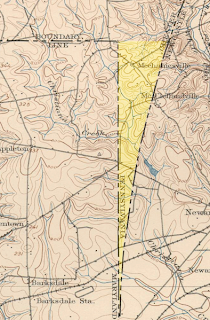 The Mason-Dixon Line intersects the circle on its north-south line, thus creating the anomaly which later became known as The Wedge. 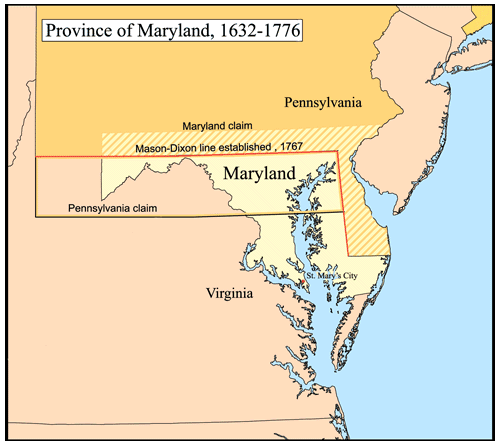 A tract of land split between Delaware, Pennsylvania, and Maryland. The Wedge ended up under control of Delaware, and formally incorporated into Delaware properly in 1921. 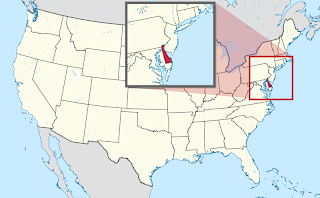 Pennsylvania claimed it as it fell outside the 12 mile circle, and on the Pennsylvanian side of the Mason Dixon Line. Delaware claimed it as Pennsylvania's border was not supposed to be below the 40th parallel. Delaware won its case. During the Revolutionary War, Delaware did not join in with great enthusiasm, with the locals still having strong links with Britain. However, forseeing the Declaration of Independence, Delaware declared itself separate of Britain, and of Pennsylvania. Establishing itself as a "new" state of Delaware. 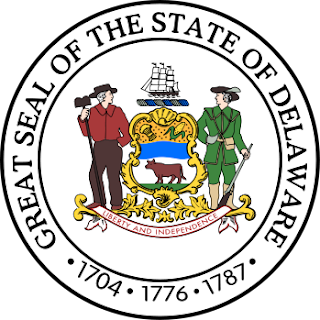 Come the new American Constitution, Delaware became the first state to ratify the document, formally becoming the first state to join the new Union. Indeed, during the Civil War, despite being a slave state, Delaware decided to stay with the Union forces. This led to the governor at the time to declare that Delaware where the first in, and would be the last out! The seal was formally adopted in 1777, just after the Revolutionary War, and has remained largely the same ever since, with minor alterations. The last tweak took place in 2004. The seal consists of the state coat of arms, and wrapped round with a disc bearing the text "Great Seal of the State of Delaware" as well as 3 dates. 1704, 1776, and 1787. 1704 is when the three counties established their own assembly, 1776 is when they declared themselves to be an independent state, and 1787 is the date of when Delaware ratified the new American Constitution. The coat of arms is a shield of red, blue, and white stripes. On the red stripe is hay, and a cob of corn. Both are taken from the arms of Kent and Sussex counties, and represent the agricultural success of the state. The blue stripe represents the Delaware river, on which the state depended for much of its trade, industry, and communications. On the white stripe is an ox standing on grass. This represents the extensive animal husbandry in the state. On top of the shield is a sailing ship, which represents the ship building industry in the city of New Castle, as well as the fact that Delaware is a coastal state. The shield is supported by a farmer holding a hoe, representing the importance of agriculture in Delaware, and a militia man, representing the central role of the militia in defending America. The motto of the state, Liberty and Independence, is carried on a ribbon wrapped round the bottom of the shield. 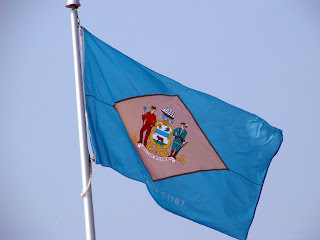 During the American Civil War, units from Delaware fought under a flag of blue, emblazoned with the state coat of arms. The current flag was adopted in 1913. The current flag is a field of colonial blue, with the state coat of arms emblazoned on a buff-coloured diamond. Under the diamond reads the text "December 7, 1787" Which is the date when Delaware ratified the new Constitution. The colours themselves reflect the colours from the uniform of George Washington.